This post is adapted from ARtillry's latest Intelligence Briefing, XR Global Revenue Forecast, Fall Edition. To receive the report and access the full XR intelligence library, subscribe here (VRARA members receive a discount). There’s been volatile interest and investment in AR & VR over the past 24 months. But how big are these sectors, and how big will they get? ARtillry Intelligence has quantified the revenue opportunity in several AR & VR product areas. The result is our latest XR revenue forecast. The largest share of revenue in 2017 was held by VR (driven by consumer markets) which will shift over time as AR (driven by enterprise markets) gains momentum and revenue dominance through 2022. This shift is notable as AR comprises 29% of revenues in 2017 and 80% in 2022. In VR, consumer revenue eclipses enterprise by 3-1 in 2022. Standalone VR like Oculus Go will accelerate consumer adoption. VR’s form factor is also aligned more with gaming and entertainment as opposed to job functions where sensory isolation isn't possible (e.g. industrial). Within AR, the opposite is true: enterprise revenue outweighs consumer revenue by as much as 2-1 over the next five years. Head-worn AR’s form factor is well-aligned with enterprise productivity and demonstrable ROI in manufacturing, assembly and medical procedures. But despite those advantages, there’s still enterprise resistance and risk aversion. We believe momentum will build up to a tipping point in 2020, after which we’ll see accelerated adoption. So it will build slow then happen fast, just like we saw with enterprise smartphone adoption. Head-worn AR will find a home with consumers, however, its specs and stylistic realities inhibit several consumer use cases in the near term. Apple’s potential 2021-2022 introduction of smart glasses will shift AR’s momentum and revenue share towards consumer spending. By 2022, enterprise AR’s revenue dominance over consumer AR will decelerate as smart glasses begin to penetrate consumer markets. Until then, mobile will dominate consumer AR, with most revenue derived from software as opposed to hardware (smartphone sales aren't counted). Mobile AR software models will continue to follow the path set in the smartphone app economy. There, the prevailing model for higher ARPU is in-app purchases. It’s been proven for both yield optimization and consumer acclimation. That's especially true in an emerging/unproven area. In fact, in-app purchases (IAP) is a model that’s already proving to resonate with consumers. At these early stages of mobile AR, many aren’t yet ready to commit upfront dollars for apps. This can be seen in our recent survey data where IAP shows early consumer comfort levels. Moreover, in-app purchases have been validated within AR, considering it’s Pokemon Go’s primary revenue source. We’ll see that extend to other IP that builds on its architecture and game mechanics, including Harry Potter, Wizards Unite and apps built on Niantic's Real World Platform. But those are just a few revenue drivers. We go deep on the dynamics and drivers across the XR spectrum including advertising and other revenue categories. 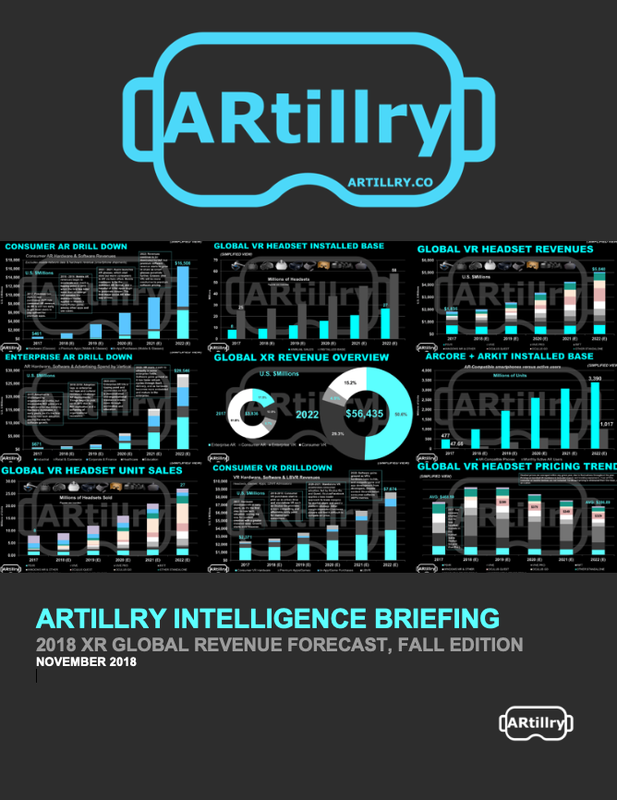 For more, see ARtillry's latest Intelligence Briefing 2018 XR Global Revenue Forecast, Fall Edition. Subscribe to receive the report and access the full XR intelligence library. VRARA members receive a discount on subscription.